If you’re in need of a moving company that is willing to move you last minute, go with a trusted mover in the Fort Lauderdale area that’s known for professionalism and reliability: Cousins USA Moving & Storage. We have been serving residents in all of South Florida since 1996, and through that experience we’ve learned how to streamline the moving process for maximum efficiency. When time isn’t on your side, we are a moving company you can rely on to get you packed and moved as quickly as possible, with no hidden fees or damage to your belongings. Cousins USA Moving & Storage knows a last-minute move is a lot of work to take on, and when looking for a moving company, choosing one quickly won’t yield the best results. Luckily, we have the experience you need to have your last-minute move carried out efficiently without sacrificing quality of care. Whether you’re looking for professional senior movers to relocate a family member as soon as possible, trying to downsize locally in the Fort Lauderdale area as quickly as possible, or just need to find safe, clean storage space for an unexpected surplus of belongings, Cousins USA Moving & Storage is here to help. 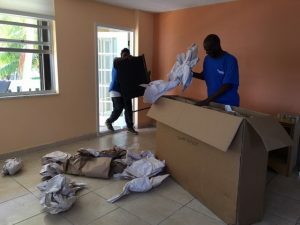 Our expert movers in the Fort Lauderdale have tried-and-true techniques and moving practices that make the last-minute moving process easy and hassle-free. If you’re in need of a moving company who can get you packed up and relocated at a moments notice, you’ve come to the right place. Cousins USA Moving & Storage is ready to get you packed, loaded and moved, so give us a call. For more information on our last-minute moves in the Fort Lauderdale area and all of South Florida, give us a call at (954) 792-6650, or fill out our online form for a free estimate.